Not all fat is bad for you, but even the healthiest fats should be eaten in moderation. Fat is a necessary nutrient for your body. But there are multiple types of fat, some of which are much better for your health than others. Knowing which fats to choose and which fats to limit—or even avoid—can help you better control your weight, your cholesterol numbers and your risk for heart disease. Let's take a look at the different types of fat. You want to limit the amount of saturated fats you consume. Most saturated fats come from animal products—think beef, lamb, poultry with skin, butter and cheese. Eating foods that contain saturated fats raises your blood cholesterol levels. Higher blood cholesterol levels, in turn, raise your risk for heart disease and stroke. Other foods that can contain high levels of saturated fats include many baked goods and fried foods, as well as some tropical oils like palm, palm kernel and coconut oil. You want to choose foods that contain monounsaturated fats instead of those that contain saturated fats or trans fats. Monounsaturated fats improve blood cholesterol levels. That can lower your risk for heart disease and stroke. Monounsaturated fats also provide necessary nutrients for your body's cell growth. Foods that are high in monounsaturated fats include nuts, avocados and peanut butter. Plant-based oils like olive, canola and safflower are also high in monounsaturated fats. You want to choose foods that contain polyunsaturated fats instead of those that contain saturated fats or trans fats. Polyunsaturated fats have much in common with monounsaturated fats. 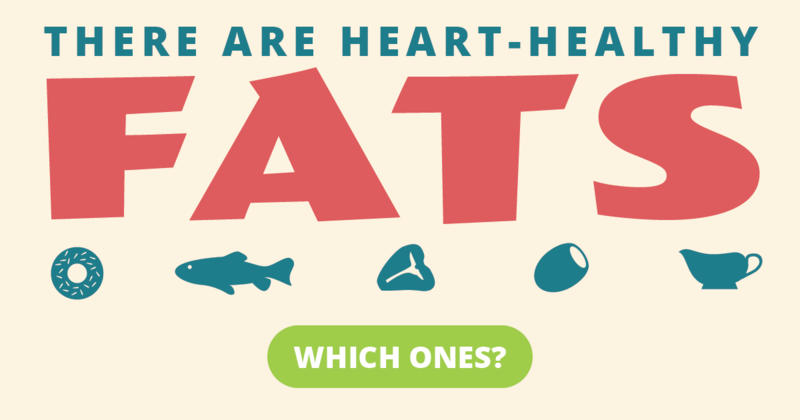 Both can have a beneficial effect on your heart—and lower your risk for stroke too. Oils rich in polyunsaturated fats also provide vitamin E and essential fats like omega-6 and omega-3 fatty acids. Foods high in polyunsaturated fats include plant-based oils like soybean, corn and sunflower oil. Other sources include fatty fish—like salmon, tuna and trout—as well as walnuts, sunflower seeds, tofu, soybeans and soft (tub) margarine. To stay as heart-healthy as possible, you want to avoid foods that contain trans fats. Trans fats are the unhealthiest fats of all—even worse for you than saturated fats. Eating trans fats raises your risk of heart disease, stroke and type 2 diabetes. Trans fats are listed on the Nutrition Facts label. But if there are 0.5 grams or less of trans fats in a food, the label can claim 0 grams. So in addition to looking for trans fats on a food label, you should also look for words like "hydrogenated" or "partially hydrogenated oil." These foods are likely to contain trans fats. Processed foods like snacks, desserts and baked goods made with hydrogenated oil. Check the Nutrition Facts label to learn about the amount and type of fats contained in a food.